When summer is in full swing, and even in the excitement of fall, it is easy to forget about winter. This may be a long or a shorter season for you, depending on where you live, but ignoring the garden is a mistake. Even if the cold keeps you mostly indoors, you still see it from the windows, and who wants to look out on a dreary scene for several months every year? So when choosing plants for the garden, don’t forget about winter. Choose some plants that have special interest at that season, so that your garden will be attractive in all four seasons, not just in one or two. Winter interest can come from unusual branch patterns, colored twigs, and interesting bark, as well as from fruits and berries. A few plants even flower in the winter months – at least in milder areas – and these are especially valuable. So with that in mind, let’s explore some groups of plants that are good choices for that important winter interest and color. Glowing in the soft sun of a winter’s day, or standing out starkly against banks of white snow, plants with colorful twigs are an effective way to bring season-long color to your winter garden. Top place has to go to the twig dogwoods. These American native plants grow wild in damp soil and along streams, but they will be perfectly happy in ordinary garden conditions too. 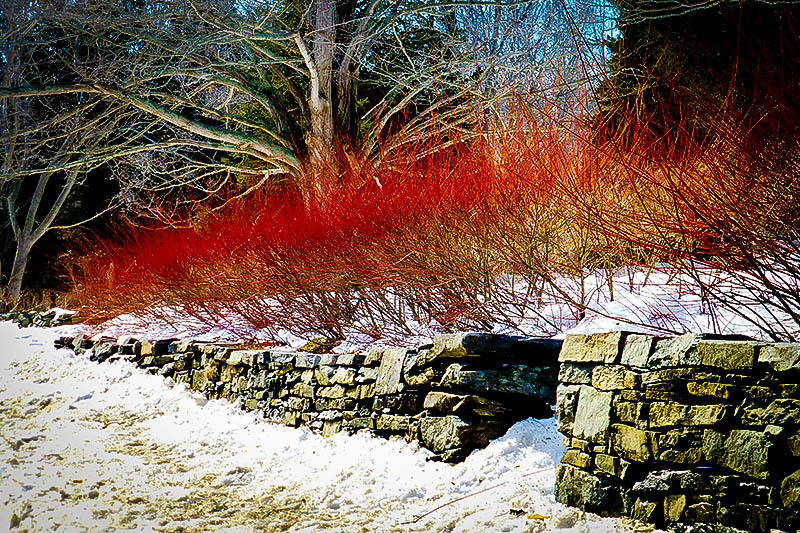 The wild plants have reddish twigs, but gardeners over the years have selected forms with the strongest colors, like the Red Twig Dogwood, as well as other colors, like the Yellow Twig Dogwood. Planted singly or in groups, these two plants will liven up the darkest days. Plant both together and the colors play off each other in an even more dramatic fashion. These easy to grow plants ask very little from you, but to get the best color, prune out older branches each spring, or even cut right to the ground every 2-3 years. This will encourage the longest twigs and brightest color. You can also cut the branches and bring them indoors to brighten your indoor spaces too. Nothing says ‘the festive season’ like holly berries, and these versatile evergreens are great garden plants too. If you have a smaller garden, plant the Foster Holly. This is the only holly that happily produces a profusion of bright red berries all by itself. With their glossy rich-green leaves, holly bushes are ideal for making your own door wreathes for the holidays, and they are excellent plants for partially shaded areas of the garden too, so no garden should be without these versatile plants. If you live in colder areas and regular hollies burn in winter, take a look at the Blue Hollies, like the Blue Girl Holly and Castle Spire Blue Holly. These tough hybrid hollies shrug off cold weather, and still carry a profusion of those sought-after berries all winter long. Southern Magnolia probably isn’t the first plant you think of when you think of winter color, although the glossy leaves with their beautiful brown velvet backs certainly bring an aristocratic look in winter. If you look a little closer you will see the fruits – like strange pine cones, nestling among the leaves. It is always a surprise when in early winter they start to open, and large, bright red seeds appear. These flash in the sunlight before eventually dropping to earth on a silken thread. If your garden is smaller, choose the Kay Parris Southern Magnolia, especially if you live in a colder region where you thought these wonderful trees would not do well. In warmer areas, the Little Gem Southern Magnolia is a reliable favorite. Of course, you always get the richly scented large white flowers, but once you notice those seedpods, you will appreciate this tree in wintertime too. To finish, let’s look at some plants with something different to offer in winter. If you live in a warmer area, the Firepower Nandina, or Sacred Bamboo, will keep its bright red fall leaves all winter long, looking great even on the grayest days. Not really a bamboo at all, this shrub have large leaves divided into many small leaflets, so it makes a beautiful mound of fine texture in a sunny or shady spot in the garden. It really comes alive in winter, and only when the new shoots appear in spring will that vibrant mound of red turn green again. Finally, let’s not forget the Crape Myrtles. Although usually thought of as summer flowering plants – and they certainly are that, especially in hot and dry parts of your garden – they can bring winter interest too. We usually suggest removing the spent flower heads to encourage more blooms, but if you leave the fall blooms untrimmed, they turn into fascinating sprays of seed heads that last all winter. Talk about versatile! You can never have too many Crape Myrtles in your garden.